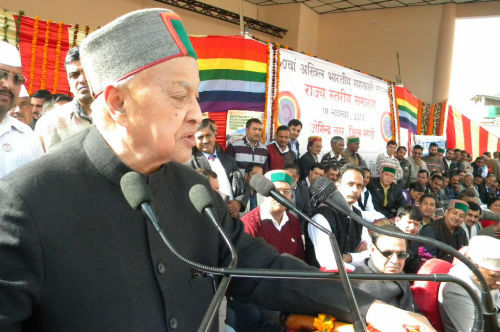 Joginder Nagar: Chief Minister Virbhadra Singh said that cooperative societies were playing significant role in strengthening the rural economy. The cooperative movement was instrumental in bringing socio-economic reforms in the country by providing self-employment avenues to the women, youth and weaker sections of the society through Self-Help Groups. Virbhadra Singh was presiding over the State level function organized on 60th National Cooperative Day at Joginder Nagar in Mandi district today. 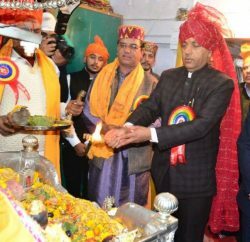 He said it was a matter of pride for the State that cooperative movement got started from Himachal Pradesh, as first Cooperative Society was formed at Panjawar village of Una district in 1892. Chief Minister said State had given importance to cooperative movement since first five year plan and today 4709 societies were registered in the State having membership of 5.35 lakh. The cooperative societies had disbursed loans amounting to Rs. 4104 crore to the farmers, fruit growers and weaker sections of the society to enable them in improving their social and economic condition. He said that in order to make cooperative societies economically viable, the State government had successfully completed the first phase of Integrated Cooperative Development Projects sponsored by the National Cooperative Development Corporation in all the districts of the State. In second phase, these projects were being implemented in Hamirpur, Bilaspur and Sirmour districts by spending Rs. 35.47 crore. The State government had also given approval to implement second phase of these schemes in Kangra, Kullu and Shimla districts for which the recommendation had been sent to the National Cooperative Development Corporation. These projects aimed at making provision of Rs. 84 crore for the above three districts to strengthen the societies. Chief Minister stressed on bringing rationalization and competitiveness among the various activities of the cooperative societies in order to compete in the open market. Virbhadra Singh said that a financial package was being implemented by the Textile Ministry of Government of India through NABARD. Under the guidance of NABARD 65 cooperative societies of the State had submitted claim of Rs. seven crore 94 lakh before State level Committee of which Rs. six crore 80 lakh had been approved upto 31st March 2013. He said that the Textile Ministry had given relaxation under this scheme and it was extended upto 31st December, 2013 which would enable more textile based cooperative societies to get benefit. Chief Minister said that the State Government was making efforts to bring improvement in the working of cooperative societies and giving them more autonomy to make them viable. He said that people were being made aware through training, camps etc. by Himachal Pradesh State Cooperative Development Federation (HIMCOFED). He directed the officers to conduct regular inspections of the societies along-with regular audit of the accounts. He announced Rs. two crore for the construction of Auditorium of Government Degree College Joginde Nagar. He said that previous Government opened various colleges without budget and infrastructure provisions and Lad Bhadol College was one of them. He announced Government would consider opening the Government Degree College at Lad Bhadol. Chief Minister also distributed prizes to the various cooperative societies for their out-standing activities. State level Prize winning cooperative societies includes The Talai Gram Seva Sahkar Sabha Samiti, The Deol Krishi Sahkar Seva Samiti, The Dawla Agriculture Seva Sahkar Sabha Samiti Kothi of Bilaspur district. Sainj Cooperative Agriculture Service Society, Bhadiyal Cooperative Consumer Store, Ghatta Milk Production Society and Bhelu Cooperative Agriculture Service Society got District level prizes. Panchayati Raj and Rural Development Minister said that State Government was committed towards the development of the rural areas and various developmental schemes were being implemented to benefit the people living in rural areas. Newly elected President Youth Congress Vikramditya Singh said that cooperatives were providing employment opportunities to the youth near to their houses. Chairman HIMCOFED Devinder Thakur detailed about the various activities being carried out by the cooperative societies in the State. Block Congress President Jiwan Thakur, former MLA Shiv Lal Sharma and President Primary Agriculture Employees Federation Vijay Sharma also spoke on the occasion. Forest Minister Thakur Singh Bharmouri, Urban Development Minister Sudhir Sharma, former CPS Tek Chand Dogra, formemr MLA Ram Singh, Chairman MILKFED Chet Ram Thakur, Vice Chairman HIMCOFED Amar Singh Saklani, Director HP Cooperative Bank Mandi Keshav Nayak, Director Agriculture Development Bank Ravi Singh Thakur, Advisor to CM T.G. 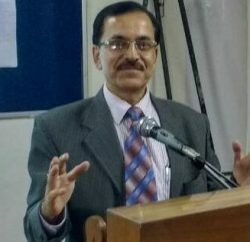 Negi, Deputy Commissioner Mandi Devesh Kumar, SP R.S. Negi, Registrar Cooperative Societies R.D. Nazim and other prominent persons were present on the occasion.